Snugg Custom Made Triathlon Wetsuits – Available NOW! We’re proud to announce that the full range of Snugg triathlon wetsuits are now available to view and purchase in both the Bike Science Bristol and Derby locations. Snugg are the UK’s most experienced wetsuit manufacturers and put those years of experience to good use in their 2011 range of suits. 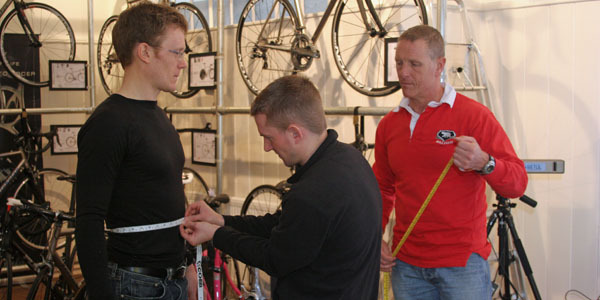 Snugg’s Malcolm Ball spent the day at Bike Science Bristol yesterday to train our fitters in the art of measuring for the perfect wetsuit fit. Snugg offer a range of wetsuits from their entry level Snugglite suit to their top of the range Slipstream with features such as Hyperflex and Diffuser panels and custom buoyancy levels. Custom fit allows us to offer you as much attention to detail in your wetsuit as we offer with each of our bikes! This entry was posted on Thursday, March 17th, 2011 at 12:31 pm	and is filed under All Posts, Products. You can follow any responses to this entry through the RSS 2.0 feed. Both comments and pings are currently closed.